Apologies - this site is currently being revamped - please revist again soon! Helen specialises in hand-dyed sock yarn, and has on offer sock knitting kits, children's knitting kits, knitting books and needles. Helen will be attending the Ledgowan craft fair on the 12 July. 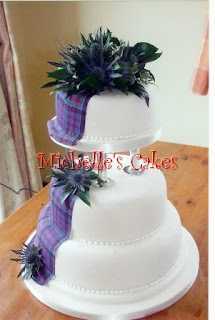 Profile: Michelle Stevenson - "Welcome to my world of cakes"
I’m Michelle Stevenson, and I am a self-taught cake decorator. I learned what it takes to make my cakes from books and, of course, using my own imagination and creativity. I am 36 years old, and live in the lovely village of Kinlochewe with my very tolerant husband Colin and our dog Jack. 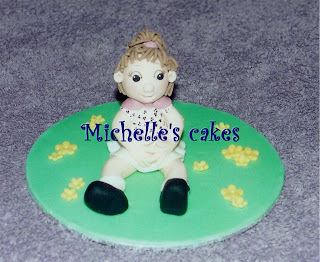 20 years ago I started out making and decorating cakes for family and friends. With more experience, new skills and even more ideas, however, I have been selling my products over the last 10 years to a wider range of clients, and have received some wonderful and encouraging feedback. A very special friend in Sussex, Barbara Emmans, taught me the basics in wired sugar flowers, when I asked her for help in making my own flower spray for my wedding cake in 1998. The odd ‘crash’ courses in other flowers, patchwork cutters, and brushstroke techniques followed. More recently, I had a wonderful day in Elgin with Tony Warren, who taught me how to make a Sea Holly using cold porcelain. A first even for me! I have had the privilege of learning sugar models with Lorraine McKay in Edinburgh; that’s where my wee girl took shape, and I now look forward to a bride and groom workshop in August this year. I am also a member of the British Sugarcraft Guild. Over the years, I have developed an exciting and wonderful hobby, which seems to be going from strength to strength. I am finally at a point, where I can branch out a little further yet again. My personal favourites are Novelty cakes, and I have been selling my tiered Wedding Cakes to a local hotel over the last 2 years, although given a pen and piece of paper I couldn’t even draw a circle. That’s the way creativity goes. 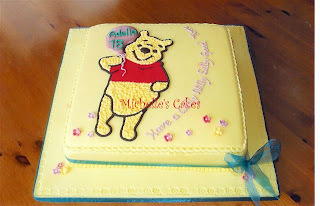 But you don’t only want to read about cake decorating when the craft can speak much better for itself. 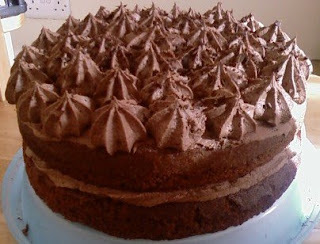 The best way of describing my cakes is, of course, to see them! 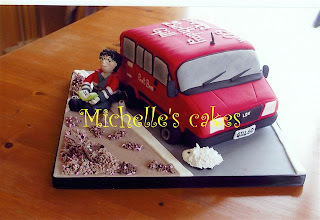 "Welcome to my world of cakes..........."
Michelle will be attending the Ledgowan Craft Fair on the 12 July. Handcrafted jewellery, earrings, bracelets and necklaces, mostly one of a kind, using a wide selection of silver, gold and copper wires, Baltic, Colombian and African amber, semi-precious and precious stones, glass, wood, in fact anything unusual, even aromatic pieces with myrrh and eucalyptus flowers. Necklaces and bracelets made to measure and guaranteed. Pieces can be designed and made on the day of fairs. Pict Design's new mobile bead shop, The Bead Buggie has just been launched. it will be selling a large selection of beads and the essentials for making your own jewellery, meeting the needs of both the hobbyist and the professional. 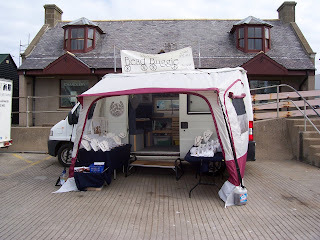 The Bead Buggie travels throughout the north of Scotland offering not just products, but also practical advice and assistance on all aspects of jewellery making. Vicky Stonebridge produces a wide range of craft items, often from recycled materials. Although trained as a potter, she is fascinated by utilising waste products and objects from the local environment to create art making something out of anything. Some of these will be on sale at the Ledgowan craft fairs (Aug 23 and Dec 6), small sculptures, driftwood mirrors, jewellery, rag weavings, reclaimed wood and textiles, bags and hats. Vicky is also a painter and will be selling original art, handmade prints and Giclee prints of her latest art work. Her paintings are both of local scenes and animals, scenes from her work as a fire-fighter, illustrative imaginative work from her 'girl and wolf' range, and Celtic rooted expressionistic work. 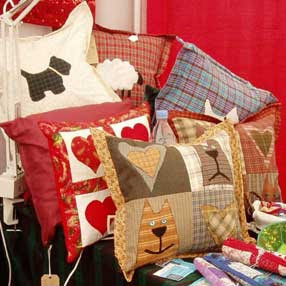 Hello, I'm Linda Bartlett and I make quilts, throws and cushion covers in patchwork, quilting and applique. I also make many other items, eg fabric books, wallhangings, needle cases, knitting needle/cutlery holders. I use traditional cottons and also tweeds and tartans. I sell made items but am happy to accept orders or help you with the design of a special project. 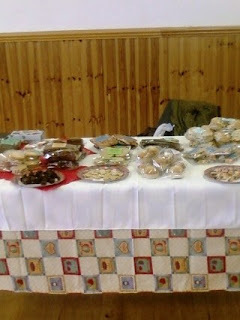 Laura writes: Laura's Cottage Kitchen is a small catering business I created in the small village of Achnasheen. Since the first time I visited Scotland 15 years ago I fell in love with it. It took a bit longer than what I envisaged to move up here, but now my dream has come true. I have always loved cooking and so I left my job as a travel agent and in June 2005 I started working as a cook in a cafe in the village. 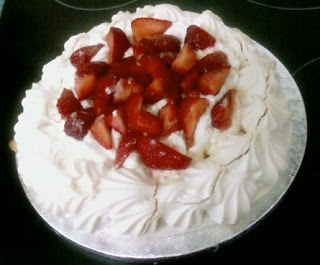 Now I have decided to be my own boss and run my small bakery. I am currently offering Brownies, Carrot Cake, Macaroons, Shortbread, Empire Biscuits, Coconut Paradise, Slice, Date and Walnut bites, Fruit Loaves, Chocolate Eclairs and other traybakes. Most of my baking is made with wheat and gluten free flour and baking powder. Like this everybody can enjoy it. 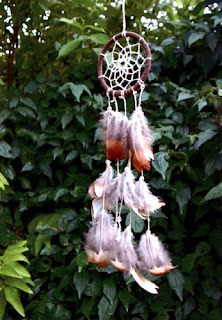 Anyone can make a dream catcher! There is an inspiring range of materials to choose from including beads, hoops, willow, feathers, yarns, threads, shells and treasures from the tide line. The process of making a dream catcher can be great fun and a good family activity. It can also be profound, healing, meditative and informative and workshops are available for those seeking a deeper, creative experience either individually or as part of a group. In a basic workshop you will learn about the legend of the dream catcher, and how to make one, The workshop finishes with “smudging” the dream catcher. These workshops normally last for one and a half hours and are open to individuals and groups of all ages. Children (minimum age 6 years old) particularly enjoy the basic workshop, choosing from a wonderful array of colourful and sparkling materials and smudging their dream catcher by lighting white sage and letting the smoke drift into the web as they concentrate on their wish for that dream catcher. Price: £10 per person, per hour, including materials. (One hour will show how to make a basic web). Group rates can be negotiated. Very young children will benefit from being accompanied by an adult. Workshops are held at Patterns of Light or in the garden yurt when the weather permits. Contact Jenny by phone or email to arrange a workshop. Visiting Jenny and Mike's Kishorn shop is an unexpected and welcoming experience. Dragons lurk beside the cornflakes, dream catchers hang over the organic vegetables, “penny” sweets are stored in an old pine cupboard and rainbows flash round the shop when the sun shines. 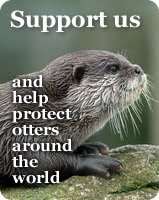 Crafts and Craftspeople supports the International Otter Survival Fund (IOSF). From time-to-time this site will also publish news from the charity. If you are interested in conservation please take a look at their website at www.otter.org and if you can please support their work. Copyright Crafts and Craftspeople 2017. Powered by Blogger.